This Diablo 3 light LED round ceiling spot light plate in matt black and gold finish is contemporary stylish and practical. Featuring a circular 36cm ceiling mount in matt black and three fully adjustable LED spotlight heads in matt black with gold inners. Perfect for adding contemporary appeal to kitchens, dining rooms and living rooms. 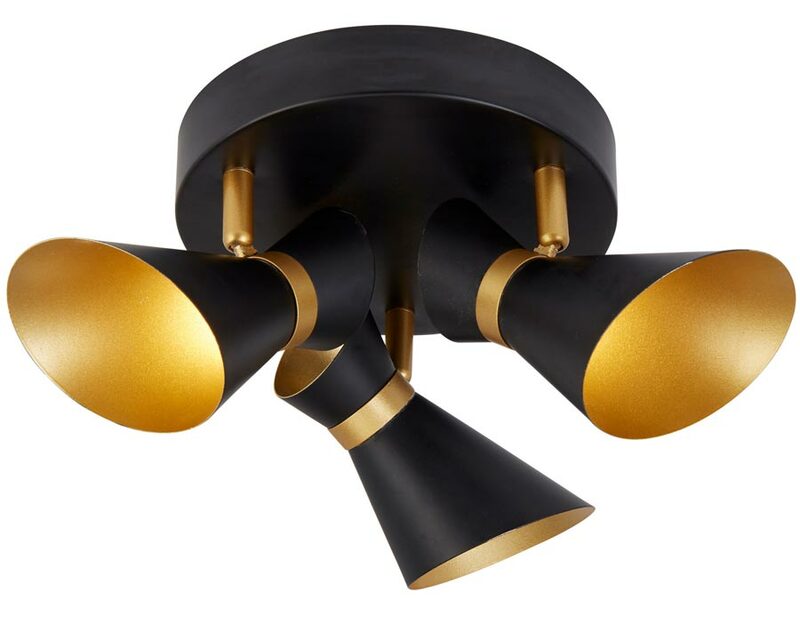 Glamorous and stylish, these 3 spotlights in matt black and gold add an instant feeling of luxury. The three stylish cone shaped spot light heads feature a slash-cut opening and the gold inner warms the light from the 4w integral LED’s. A flexible lighting solution for almost any room in the house; fitted with a total of 12w of warm white energy efficient lighting that gives 1200 lumen’s. There are matching products available in the black and gold finish Diablo spotlight range that includes a switched wall light, two, four and six light ceiling spots and table and floor lamps; please see below. Also available in black and white finish with chrome highlights, please enter the term Diablo in the search box at the top of this page to discover the complete range. This ceiling light is supplied by Searchlight who manufacture some of the best traditional and modern classic designs such as the Diablo 3 light LED round ceiling spot light plate in matt black and gold you see here.